The youngest of the Liversuch sons, Bert was probably eager to prove himself and was certainly capable. On his eighteenth birthday, Bert went to the recruiting office. He applied as an airman but was refused on grounds of color vision problems. He then reapplied as a private in the British Infantry and was accepted. He was now a six foot two inch tall member of 'Her Majesty's Welsh Regiment'. Still, this wasn't enough for Bert. As soon as possible, he applied to the Army Air Corps and was accepted. He was transferred to the Manchester Barracks for training in the 6th Airborne. To keep the record straight - It is not completely clear where the spelling of the name from 'Liversuch' became transformed to 'Leversuch' in Bert's case. Some think it was a simple typo when the British found and buried Bert in France, and some evidence shows that he had this spelling in correspondence during his military career. The fact is that this is how it is now spelled on his grave and I will continue to spell it that way whenever appropriate throughout this site. 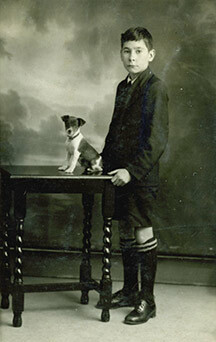 While World II was raging around him, Bert was a young apprentice with a grocery chain in Cardiff, South Wales. 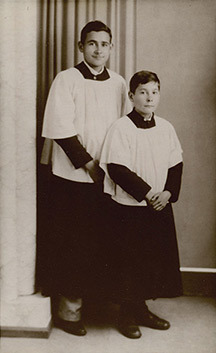 His dad became an air raid warden and Bert followed a few years later, spending a short time as a member of the Home-Guardsmen when he was seventeen years old. As soon as he turned eighteen, he paid a visit to the recruiting office. Once he was officially enlisted, Bert caught the bus home to announce it to his parents. 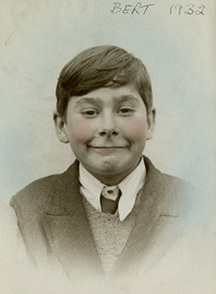 Before long, he was posted to basic training school with the Welsh Regiment in Crws Road Barracks in Cathays, Cardiff. This culminated in the Passing Out Parade (graduation ceremony) and they were full Infantrymen. They had finally earned their berets and their Prince of Wales Feathers with the gold and silver triple ostrich feathers. Bert wore them with great pride. Bert at one and a half years. Bert and his dog Bonzo. Ray and Bert as alterboys. Bert Leversuch. A proud new soldier. members of the 6th airborne into France. Photo Credit: Royal Air Force. Motto: 'Utrinque Paratus' Latin for: ‘Ready for Anything’. 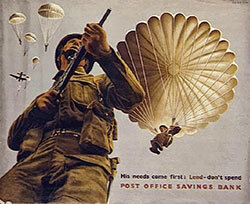 On 23 April 1943, the 6th Airborne Division was approved for formation. It was one of only two. There was already the 1st Airborne Division and now the 6th. 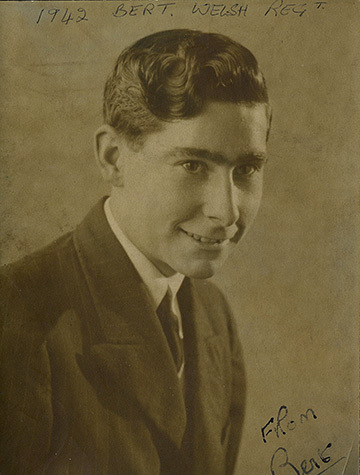 Not long after becoming an Infantryman with the army, Bert applied, was interviewed and finally accepted with the Army Air Corps under the name of "Special Services". He was now a paratrooper. He did his training in Manchester near the Brecon Beacons. Bert was then assigned to the 1st Platoon, 'A' Company of the 6th Airborne as a Private. 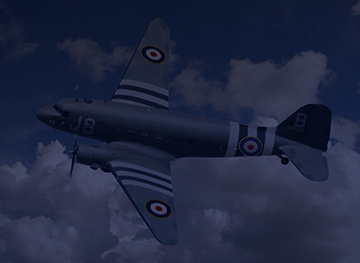 On the evening of Monday, 5 June 1944, Bert along with members of his platoon, boarded a C.47 and began the flight to Normandy. Their mission was to take and hold the Benouville Bridge (now named the Pegasus Bridge after the emblem of the 6th Airborne troops) traversing the Orn River so allied forces could use it and to make sure the German forces could not sabotage it. Why do they call it 'D-Day'? This is an excerpt taken from The Pegasus Archives Website Regarding the 6th Airbourne, 8th Battalion where Bert was involved. The 8th Parachute Battalion was formed in early 1943 from the 13th Battalion The Warwickshire Regiment. As with all such conversions, the majority of the men of the original battalion either did not wish to become paratroopers or failed the subsequent weeding out exercises, designed to remove all but the very best soldiers. This process complete, the remainder of the Battalion was made up of volunteers from other units, however to retain the regional characteristic, the majority of these were drawn from Regiments in the Midlands region; hence the Battalion is sometimes referred to as the 8th (Midland Counties) Parachute Battalion. 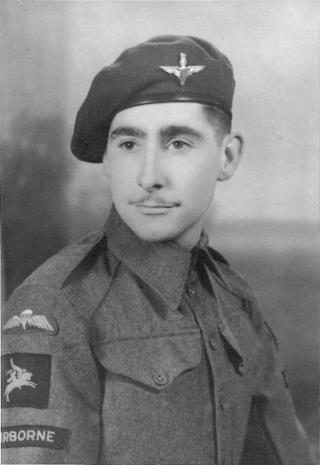 Lieutenant-Colonel Hildersly was its first commander, but he was succeeded in the latter half of 1943 by Lieutenant-Colonel Alastair Pearson DSO MC, one of the most respected, experienced and highly decorated officers in the history of the Parachute Regiment. At the time of Pearson's arrival the 8th Battalion were having problems. They had not reached the level of efficiency that was expected of a parachute unit, and their morale had recently been shaken by two tragedies; during a night exercise in Scotland, a stick of parachutists had accidentally jumped over the sea and all but one man had drowned, and eight more were killed when their aircraft crashed into a hill in the south of England. Lieutenant-Colonel Pearson's first act was to completely overhaul the Battalion's command structure, and having personally interviewed every officer and NCO, he concluded that three company commanders and a high number of sergeants were unsatisfactory and so returned them to their former units. Their replacements were hand-picked, with younger officers being appointed from outside the Battalion and NCO's from within. With this firm base from which to build, the men of the 8th Battalion were put through a rigorous training programme, designed to further highlight and remove anyone who did not meet the Regiment's high standards. As an experienced commander, Pearson was allowed to get on with things as he saw fit without outside interference; his old friend and Brigade Commander, Brigadier Hill, trusted him completely and obliged by staying away, whilst Major-General Gale agreed to temporarily excuse the 8th Battalion from distractions such as visits by passing luminaries. As a result of Pearson's uncompromising attitude and many hard months of training, the 8th Battalion overcame its difficulties, regained its confidence and became recognised as one of the best battalions in the Division. 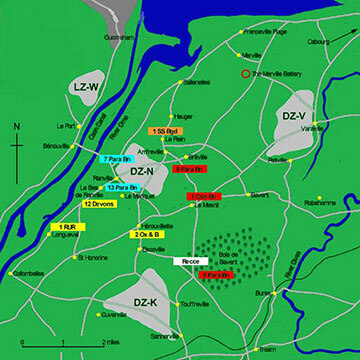 6th Airborne Jump Zones Map, 6 June 1944. 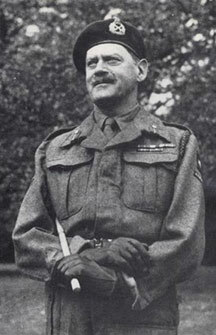 Frederick E. Morgan is credited with the original concept and plan for 'Operation Overlord', the Hail Mary invasion by the allies to bring a final and decisive end to World War II. It didn't go as well or as quickly as intended, but it was the turning point that would put the world of freedom back on it's axis. During the initial phase of the Normandy landings, the 8th Battalion perhaps had the most independent role of any of the units of the 6th Airborne Division. They were the only battalion to have their own drop zone, DZ-K, three miles to the south of the main force at Ranville, and over the following week they were effectively fighting their own private war in the south-eastern corner of the Divisional area. 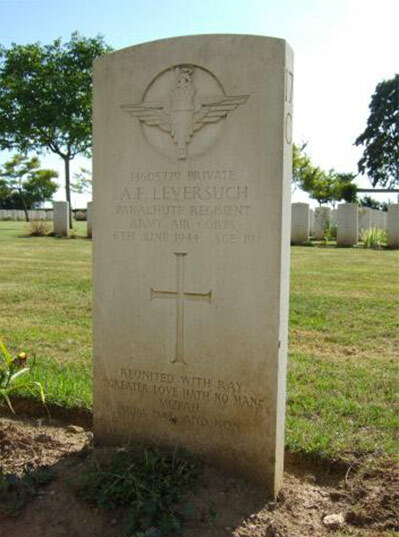 Due to poor visibility and shortcomings with the deployment of the pathfinders, all parachute elements of the 6th Airborne Division suffered when they dropped at 00:50 on the 6th of June. The 8th Battalion were further frustrated as some of their pathfinders had accidentally landed three miles away at Ranville, and as a consequence fourteen of the Battalion's thirty-seven Dakota aircraft released their parachutists there instead. The Battalion's primary objective on the first night was to protect the Royal Engineers of No.2 Troop the 3rd Parachute Squadron as they demolished a road and a railway bridge at Bures and a further road bridge at Troarn. Having gathered together just one hundred and forty-one men at the Rendezvous Point after waiting for more than two hours, Lieutenant-Colonel Pearson decided that he could delay no longer and began the advance. In preparation for their ultimate objective, the defence of the Bois de Bavent woodland which defined the south-eastern tip of the bridgehead, this force came to a halt in the woods and proceeded to dig-in, whilst elements of No.2 Troop made their way to Bures. 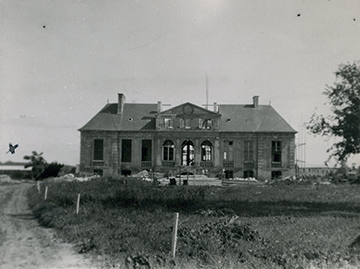 Both bridges were destroyed by 09:15, and when this party returned to the Battalion they were ordered to proceed to the bridge at Troarn, with No.9 Platoon assigned to protect them. Following several successful actions against the enemy along the way, the group arrived at the bridge to find that other Engineers had blown it some hours earlier. Nevertheless they laid further charges and increased the damage. With the bridges destroyed, the 8th Battalion's task was to hold the Bois de Bavent woodland and to do all in their power to harass enemy troops in the area, especially those advancing westwards with the obvious intention of crossing the River Orne at Caen and attacking the seaborne landings. During the following days, while the rest of the Division struggled to hold its gains, the isolated 8th Battalion found themselves fighting a very different battle to that of their comrades. The closely wooded terrain made heavy attacks impossible, and so both sides resorted to mine laying, establishing outposts and patrolling aggressively. The 8th Battalion's positions were also shelled frequently, and during the first days, until substantial overhead cover for their dugouts could be improvised, the paratroopers suffered many casualties as a result of lethal splinters from tree bursts. Lieutenant-Colonel Pearson ensured that the initiative remained with his men, and to this end they patrolled far and wide in the surrounding area, sometimes as far as Bures and Troarn, constantly making a nuisance of themselves by laying ambushes, mining roads, and raiding enemy positions. 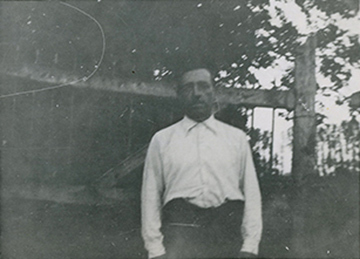 Life in the Bois de Bavent was far from pleasant because little sunlight could penetrate the canopy of trees, creating particularly damp conditions which attracted flies and mosquitoes and made it impossible for clothing to be dried. It was doubtlessly with some relief, therefore, that the Battalion was withdrawn from the area on the 16th June to allow the battered 3rd Parachute Brigade a period of rest. Following their return to the front line and for the following six weeks, the 8th Battalion continued its ceaseless routine of patrols and harassment. It was D-Day -1 and all preparations had been completed. The plan was for D-Day to launch on the night of June 4th. And for the main body of the force to arrive at Normandy on the morning of June 5th. The Battalion is prepared to emplane but a message arrives at approximately 1600 hours that the weather is too bad and they are stood down for the next 24 hours. 2115 hours, the Battalion is moved from the Transit Camp to Blakehill FM Airfield. 2240, the Horsa Gliders are towed into the air by the Tugs C.47s. 2130, Bert’s and the other C.47 Aircraft take off for Normandy. 0020 the Pathfinder Sticks arrive at the DZs, (Drop Zones), near Touffreville. Two of the 8th Battalion’s Recce Parties (Long Range Reconnaissance Patrols.) are dropped. Bert’s plane comes under intense enemy fire and the left engine is hit. He and the men with him are forced to abandon the crippled aircraft just short of their planned drop zone. His chute opens safely but he is hit by enemy fire before landing. According to Ron’s account, While enroute and short of their target drop zone, they came under intense enemy groundfire just after reaching France and the port engine burst into flames. The plane was going down and the men were ordered to bale out to save themselves. Unfortunately, this turned out to be over a stronghold for the Germans and a huge firefight erupted. According to reports, the order was given to'Jump or die'. Along with others of the 6th Airborne, Bert fastened his clip to the jump cable and in turn jumped from the C.47 Dakota into the night. It was moonlit and there were some light clouds. Muzzle and mortar flashes, explosions and fires began to dot the landscape below him. His parachute and others were picked up by the searchlights as they drifted down too. This made them easy targets for the german ground troops and snipers in the area. The helpless paratroopers were being shot out of the air and Bert was hit in the lower abdomen before he landed. He and two others – Corporal J.M.B. Rogers and Private T.R. Scott hit the ground and laid in the dew under a hedge near a ditch. Corporal Rogers and Private Scott had died, but Bert had survived. They were just on the outskirts of the small town of Sannerville. A map of the plans for Operation Overlord. If you click the map, you will notice that on the right side, there is a picture of a small blue plane. I believe that marks the route that Bert's plane took that night. The box above it is marked 'BR - 6'. Likely for 'British 6th Airbourne. 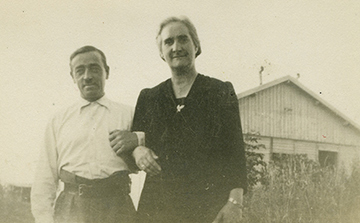 This is a photo of the French Farmhouse where Bert landed and was killed. A small 'X' on the left side indicates the area where he is thought to have landed. 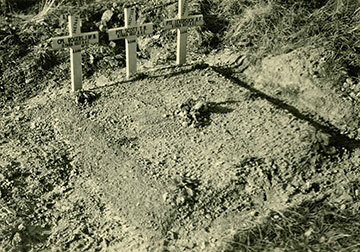 The temporary grave where Bert was buried on the morning of Tuesday, 6 June 1944. French Freedom Fighter With Jessie. According to reports, this pleasant-faced and gentle friend of Jessie's helped to beat Bert's killer to death. the very spot where Bert was killed. A group of three French Freedom Fighters named M. Heuze, M. Anne and M. Las had witnessed Bert's descent during the heated battle. Badly wounded, Bert managed to crawl to cover from further enemy fire in a search for safety and assistance. The French soldiers tried to signal him but were pinned down themselves. They made frenzied hand gestures and whispered to Bert in the dark of the night. They were trying to warn him that the area was covered by enemy snipers and to stay low to the ground, but he could not understand what they were saying. A moment later, he lifted his head to see what he could and was struck above the left eye by a sniper’s bullet. It killed him instantly. The sniper, likely thinking that he was now safe, came out of hiding and ran to Bert’s body. The French Fighters watched as the sniper began to rob Bert of his possessions, his crucifix, and his boots. This gave the Frenchmen an opportunity to sneak up and overpower him. They either beat or stabbed him to death and once done, noticed that the German sniper’s feet were wrapped in old bits of sack cloth. Two Sannerville residents took over from there. They wrapped Bert's body in his parachute and concealed him and the other two men in a haystack overnight so the German troops could not find them. The next day, when the battle had subsided in the area, Bert was taken to the bombed out yard behind a nearby church alone with the two other members of his platoon and was buried there. 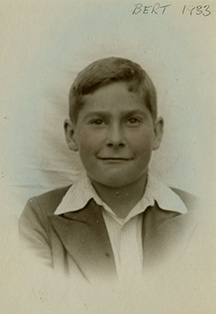 At the time of his death, Bert was nineteen years old. He had volunteered for this part of the mission and was one of the first sixty men to cross the English channel into France for the D-Day Invasion. Although the plan was for the Allied Forces to take Caen on the first day of the attack, it actually took them more than a month to accomplish this goal. The German forces turned out to be a stronger foe than general Montgomery had anticipated. Caen was a highly sought and strategically necessary gateway to the rest of Europe and the Allies were determined to take it. General Montgomery was in charge of this aspect of the invasion and had badly underestimated the Germans' resolve to hold it. Thousands of British, Canadian, and American soldiers were lost in this hot spot of the battle, but it was finally taken. During the D-Day invasion, more than 13,000 paratroopers were dropped over France. 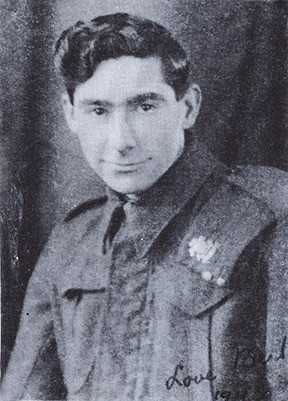 Bert and others of his division were among the first to make the ultimate sacrifice. 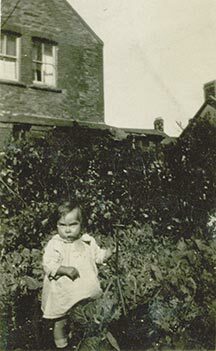 On Wednesday, 28 June 1944, a letter arrived at the home of Albert and Jessie. 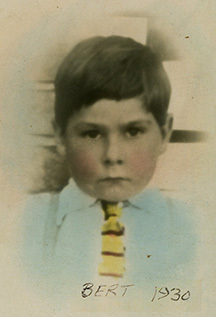 was posted as "Missing" on the 6th of June 1944 in northwest Europe. for Officer in charge of Records. We are so grieved to learn from your letter of December 22 the sad news that the War Office have now presumed your son to have lost his life. The official report of this has not yet reached us and I am sorry tgat up to now, no further information of any sort has been received by us since Private Liversuch was first reported missing. We cannot tell you anything about the incident you have quoted and being published in the papers, but we think it most unlikely that the bodies of these men were found by the Red Cross. It would almost certainly have been by our troops, and the circumstances would have been reported to the War Office. asking wether there is any reason for thinking that one of these men might have been your son. Perhaps you would be so kind as to let us know what reply you have from the War Office. You must be very proud of the wonderful courage of Private Liversuch in having volunteered for such service, and if he has given his life in the service of his country, we can only hope that to some extent, you will be sustained in your sorrow by the memory of his splendid example. The next morning, Bert was hastily buried in a temporary plot along with the two other men as the battle was still going on not far away. It was a church yard where the men would remain for three years before being moved to their final resting place in the Banneville Le Campaigne Cemetery.